When I think about self reliance, I think about how I can learn to take care of myself and my loved ones in times of need. In desperate times, it may not be possible to have all of your food, medicines, and supplies with you at all times. It’s a great idea to learn how to forage for wild edibles and medicinals so that you can heal yourself and eat “on the go”. And since I’m participating in the #SelfRelianceChallenge for the month of May, this is going to be my first challenge. Challenge #1: Foraging. Learn to forage 3 edible or medicinal plants that are in your area. I want you to do your research! Get out there, look at the wild plants and weeds that grow near you. Ideally, the 3 plants should be in abundance around you. Make certain of your identification, and learn everything that you can about them. I am also going to give you a Materia Medica template at the bottom of this post that you can print out and fill in. Do one for each plant you have researched, and keep these pages in your emergency binder so they are handy when you need them. 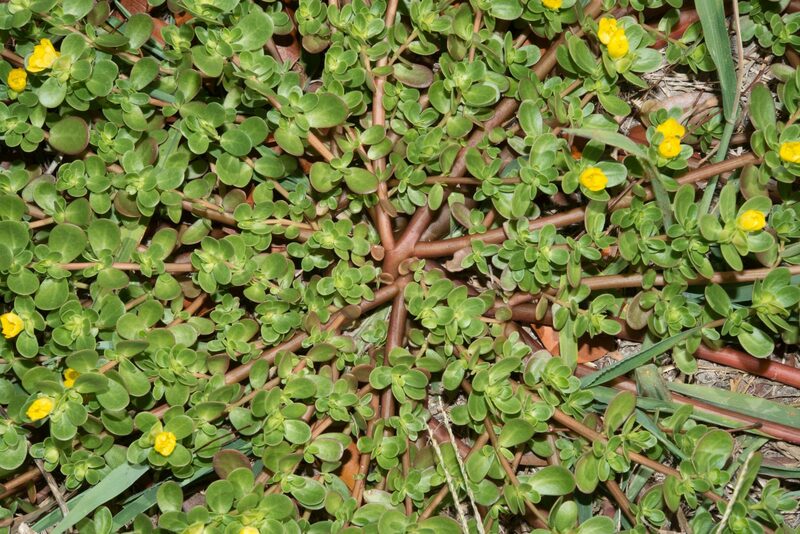 Purslane is a low-growing weed that grows well in even low-quality dirt. You will often find it in sidewalk cracks and empty fields. As a succulent, it loves heat. The tear-shaped leaves are almost “puffy”, and grow alternately on smooth, round, reddish stems. It has small yellow flowers when it is in bloom, and the seeds look like tiny poppy seeds. Purslane is a great edible weed, as you can eat the flowers, leaves, stems, and seeds. It has a slightly tangy flavor, almost lemony, and tastes great raw in a salad or on a sandwich. It can also be cooked, like in a stir fry. Purslane has a slightly mucilaginous quality when cooked, and is even sometimes used to thicken soups or stews. I personally have only eaten it raw. This lowly weed is surprisingly one of the best plant sources of Omega-3 fatty acids, and has nearly no cholesterol. Purslane has lots of nutrients, including vitamin A, vitamin E, vitamin C, iron, calcium, magnesium, manganese, potassium, and beta-carotenes. 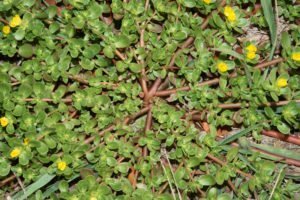 Fresh Bites Daily has a wonderful-sounding recipe for Purslane Salad. Check it out, and let her know I sent you! 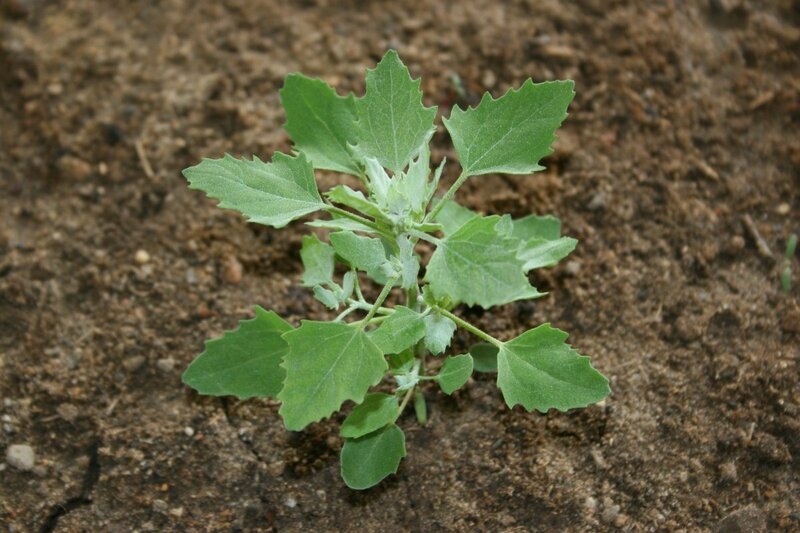 Lambsquarters, also known as wild spinach, is a generally tall weed that also grows nearly everywhere. The leaf is shaped like a goose foot, which is another one of its nicknames. Leaves are soft, have jagged edges, and have a white powdery coating on the underneath. The leaves and stems can be eaten raw when young, but when they mature they get a little tough and are best cooked like spinach. Lambsquarters is another vitamin-packed weed. Like Purslane, Lambsquarters is high in iron, calcium, beta-carotenes, and potassium. It also has vitamin C, vitamin A, riboflavin and niacin. Melissa K. Norris from Pioneering Today has a recipe for Lambsquarters pesto that sounds amazing. I WILL be making this recipe this year from my patch of wild lambsquarters. s at the top. The leaves are very helpful for lung issues such as bronchitis and asthma, and the flowers can be infused in oil to help an ear infection. 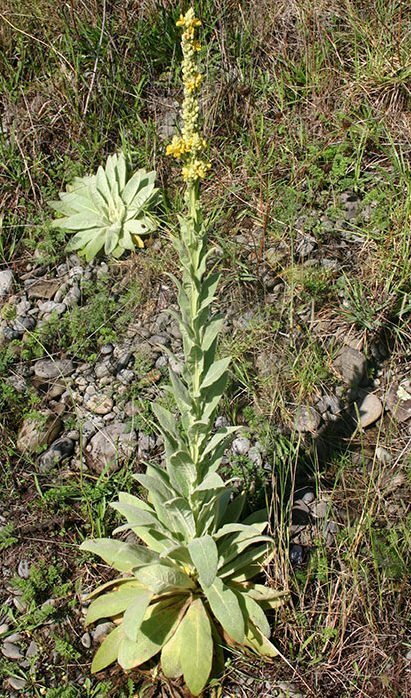 Mullein is anti-inflammatory, analgesic (pain relieving), and is an expectorant that helps loosen mucous and relieve coughing. 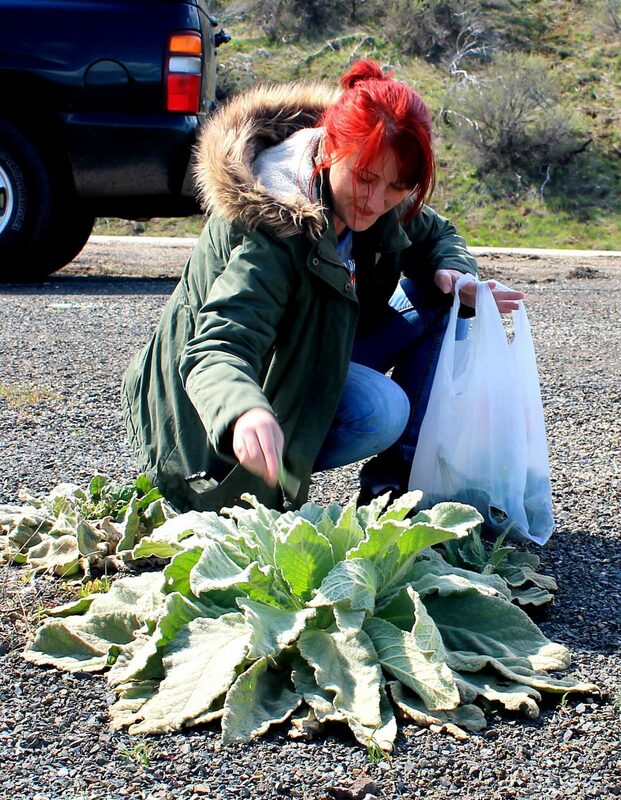 Mullein is so soft that, in a pinch, it could be used as toilet paper. I have steeped the dried leaves into a tea many times when my lungs felt tight with congestion. Joybilee Farm has a great tutorial for how to make mullein flower oil, for earaches and swimmers ear. And, as promised, here is the Materia Medica for you to use for your researching. 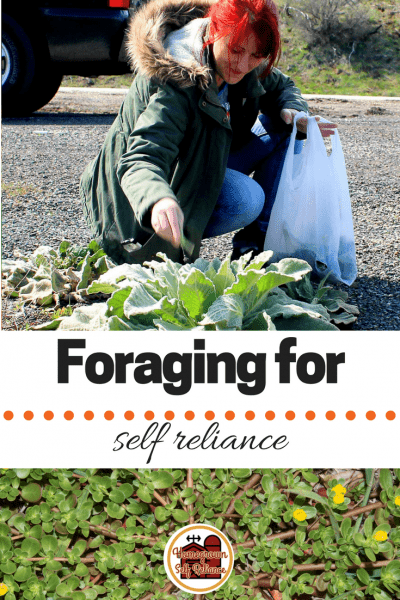 Love learning about foraging! I’m enjoying meeting all the bloggers that are a part of this challenge! It’s been very fun, hasn’t it, Nancy? Thanks for stopping by! Great information and ideas for week one of the challenge! I have been looking into foraging and using herbs as medicines on my homestead recently. Good luck throughout the challenge! Thank you, AnnMarie! Good luck to you too! Too early for any of that here. May is too early? Where are you at? Weeds are growing in full force here in Idaho! 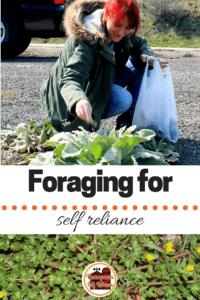 Great overview and wonderful choices of plants to forage, I harvest a lot of all three of these here on the farm. I am in the same boat as Anne, very few of these are up yet here in Ontario, Canada in Zone 5. They are coming though. Thank you Val! Don’t worry, spring is coming soon for you too! It’s actually been getting downright hot here the last few days! Hi ShawnaLee, thanks for the great post! I love foraging and using nature as medicine! I even actively grow mullein and plantain in my greenhouse! That’s great, Frank! I have thought about actively growing these but I think most people would think I was crazy! I don’t know anyone who actually TRIES to grow them, but I think it would be a wonderful idea! Hi Maria, you definitely should! They’re delicious and shouldn’t be just used for the animals! But my goats and chickens love them too!